Today they were all here and we jumped on the golf cart (the six that can hang on by themselves) and off we went through the country roads for an adventure. 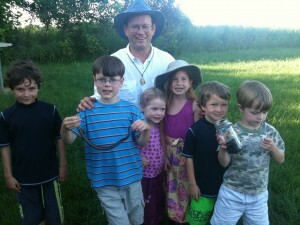 In the picture you can see Dominic holding the snake we caught. He was the Keeper of the Snake. Damian was the noble “Keeper of the Jar of Black Raspberries” making sure there were enough to share with the lady folk back at home. We picked flowers for the mom’s, climbed up the Evil Tower, picked berries, saw wild birds and had a noble, knightly adventure! Then we came home to Jesse’s homemade mango ice cream, black raspberries in cream, and a severed head. Oh, I better explain that. Each grand kid is named after a saint. Their saint’s feast day is as special as the kid’s own birthday and they celebrate both days with great pomp and circumstance. Joshua Thomas was named after Thomas More who had his head cut off because he refused to compromise the Catholic Faith and died a martyr. So to remember his death we always have something to remind us of his beheading. 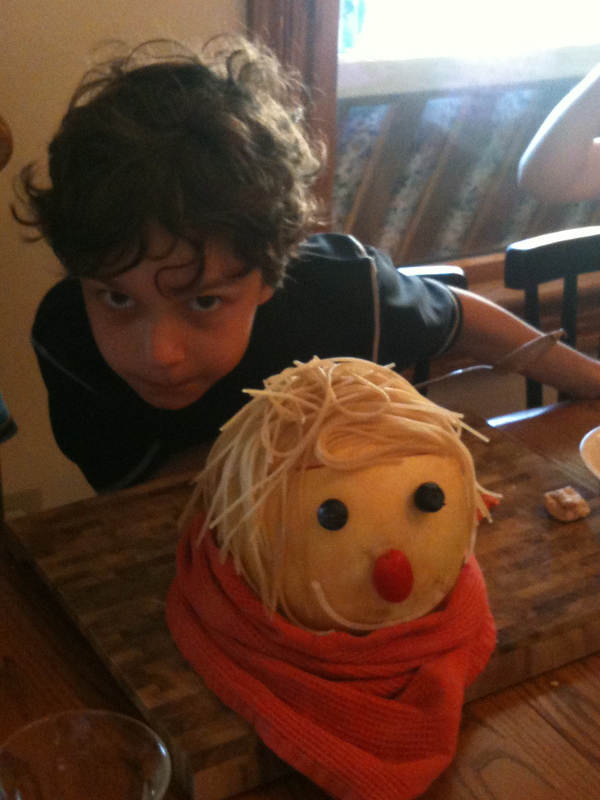 Today it was a golden honeydew melon setting on a plate with spaghetti for hair, some eyes, a nose and a mouth. The severed head was delicious and we all thanked God for the martyrs, especially the English martyrs Sts. Thomas More and John Fisher. I was the second guest on Catholic Answers Live at 7 PM Eastern answering Questions from Non-Catholics. We had some great questions and the first one went on for 35 minutes since it was very intense though friendly. The question was “How can you claim the Roman Catholic Church is the one true church when so many others claim that as well?” It also got into the issue of authority, where we got the Bible, and many other interesting and often aggressive give and take. 1) My husband was baptized Catholic, divorced and then married me. Why did the Church insist on an annulment (which we did not get)? 2) Why do you use the word “convert” to explain your joining the Catholic Church when you already believed many of the same things? 3) If the New Testament says we are all priests, why do we need Catholic priests? To listen on line, click here. To see other listening options, click here.